Here is a selection of holiday stationery, including a Santa design, that you can use to write family and friends special messages for Christmas. 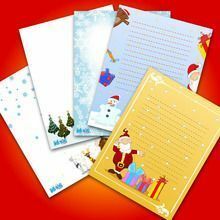 You can also use the Christmas stationery to write Santa himself a letter. Just select you favorite designs and print. You just have to choose a template from the list below. Click on the one that you like and print. You can choose from designs with Santa, reindeer, snowmen, and even with the Magi. Some of these designs are in the form of postcards: Print them, fold them in half along the dotted line and glue both sides. Discover all the jolly Christmas fun from Hellokids.com.